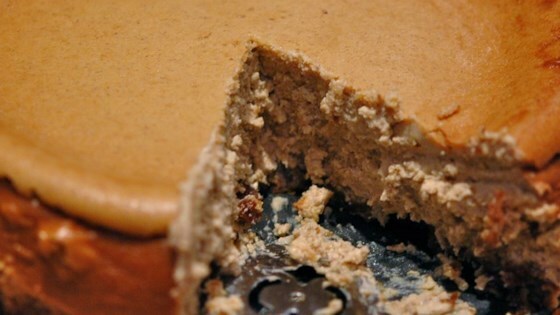 "Pumpkin cheesecake with ginger snap crust - an old classic recipe." Preheat oven to 325 degrees F (165 degrees C). Grease and flour a 9 inch springform pan. Using a fork, combine gingersnaps, hazelnuts, 3 tablespoons brown sugar and melted butter. Press mixture onto the bottom and two inches up the sides of the pan to form the crust. With an electric mixer, beat cream cheese and brown sugar until light and fluffy. Stir in the pumpkin. Mix in the cream, maple syrup, cinnamon, allspice and vanilla. Beat in the eggs, one at a time, mixing until smooth. Pour batter into prepared crust. Bake in the preheated oven for 90 minutes, or until center of cheesecake is set. Allow to cool in pan for 30 minutes, then refrigerate overnight. I omitted all nuts from the crust and it still turned out great! The pumpkin filling was nice, but next time I want to use pumpkin pie filling instead of pure pumpkin for more flavour. Gingersnaps make this outstanding!! I've made pumpkin cheesecakes for years, but this makes a world of difference! !